Eve Beglarian "is a humane, idealistic rebel and a musical sensualist." "One of new music's truly free spirits,"* and a "remarkable experimentalist," she is a composer, performer, and audio producer whose music is "an eclectic and wide-open series of enticements." She recently completed a four and a half month journey down the Mississippi River by kayak and bicycle, which is documented on her RiverBlog. Her chamber, choral, and orchestral music has been commissioned and widely performed by the Los Angeles Master Chorale, the American Composers Orchestra, the Bang on a Can All-Stars, the Chamber Music Society of Lincoln Center, the California EAR Unit, the Orchestra of St. Luke's, Relâche, the Paul Dresher Ensemble, Sequitur, and individual performers including Maya Beiser, Lauren Flanigan, Sarah Cahill, and Marya Martin. Highlights of her work in music theater includes music for Mabou Mines' Obie-winning Dollhouse, Animal Magnetism, Ecco Porco, and Choephorai, all directed by Lee Breuer; Forgiveness, a collaboration with Chen Shi-Zheng and Noh master Akira Matsui; and the China National Beijing Opera Theater's production of The Bacchae, also directed by Chen Shi-Zheng. She has collaborated with choreographers including Ann Carlson, Robert LaFosse, Victoria Marks, Susan Marshall, and David Neumann, and with visual and video artists including Cory Arcangel, Anne Bray, Vittoria Chierici, Barbara Hammer, Kevork Mourad, Shirin Neshat, and Judson Wright. Performance projects include the new RiverProject band Brim, Songs from a Book of Days, The Story of B, Open Secrets, Hildegurls’ Ordo Virtutum, twisted tutu, and typOpera. Recordings of Eve's music are available on Koch, New World, Canteloupe, Innova, CRI Emergency Music, OO Discs, Accurate Distortion, Atavistic, Naxos, and Kill Rock Stars. 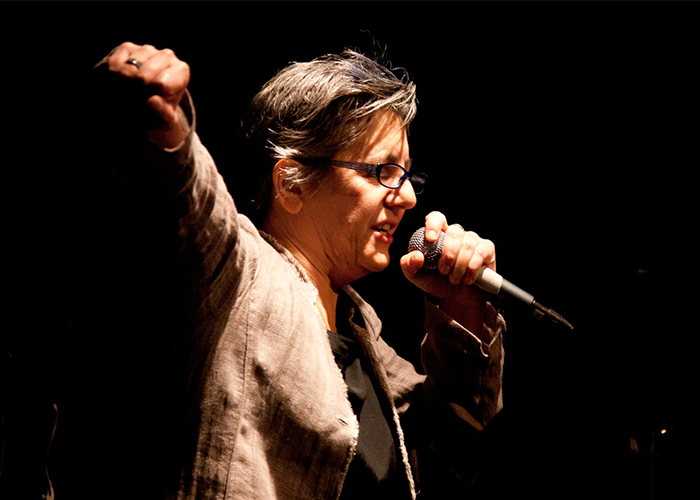 Beglarian was a featured composer for the 2012 Avant Music Festival presenting a mixed evening of songs, many of them performed by singers other than herself for the first time. Beglarian’s video work was featured in the 2013 presentation of John Cage’s Apartment House 1776 and will appear in Cage’s Song Books celebrating Cage’s 102nd birthday to kick off Avant Media’s 2014-15 Season.